During the 1985 earthquake, as the churches shook, straw and terracotta statues of saints came crashing to the ground. The Christian garb of a number of these statues fell away, revealing stone effigies of pre-Hispanic Gods. The writers who speak in this book explore what is concealed by the façades of political institutions and cultural reputewhat lies hidden inside the statues of saints. From the perspective of a Canadian who knows Mexico intimately, George Szanto spoke with Mexican fiction writers. In telling their stories these writers disclose a civilization, a hidden Mexico beyond its sunny beaches and steep pyramids. 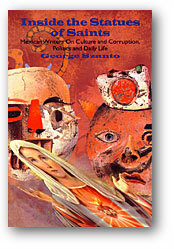 The intent of Szanto's essays, along with his interview with Carlos Fuentes, is to provide insight into the daily life of Mexico's people and the fears and hopes by which they perceive and practice their lives. Elena Poniatowska has spent a lifetime revealing Mexicans to themselves. She believes that the Chiapas rebellion will changes the course of Mexican history. Subcomandante Marcos invited her to interview him. Paco Ignacio Taibo II's focus is Mexico City's politico-criminal underbelly. A professor of history he is the author of some fifty books, including detective novels. Marëa Luisa Puga, winner of Mexico's highest literary award, sees the division between Mexico City and the rest of the country as an immense threat to a unified Mexican nation. Juan Villoro, the youngest writer Szanto speaks with, believes that the Mexican written word is inconceivable without the work of Faulkner, and is concerned about TV-addicted kids. Ricardo Perera's work is out of the mainstream and he is little published. His well-crafted stories are read as ideologically distant from the literary establishment. Among the more invisible elements of Mexican society is a vibrant Jewish community of about 80,000the context for Margo Glantz's autobiographical novel, The Family Tree, which searches the mysteries of her family's past. The eloquence of Carlos Fuentes is revealed in an interview entitled "Our Personal Frontier with Latin America" which serves as an epilogue to Inside the Statues of Saints. George Szanto is the author of The Underside of Stones and Not Working [which was a finalist for the Books in Canada First Novel Award]. His short story collection, Friends & Marriages, won the 1995 QSPELL Hugh MacLennan Prize for Fiction. When not teaching Communications and Cultural Studies at McGill Univesity he spends as much time as he can in Mexico.